Once during Sun Shang Xiang's turn, she can discard two hand cards and select a male character who is not at full health. By doing so, she heals herself and the male character one unit of health each. For each piece of equipment that leaves her equipment area, Sun Shang Xiang draws two cards. "Marriage" cannot be activated on a male character who is at full health, but Sun Shang Xiang can be at full health when she activates this ability. 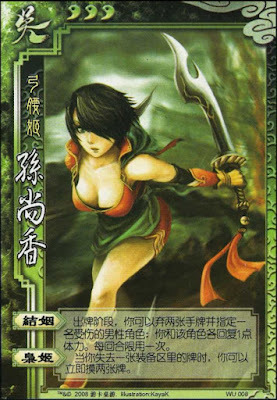 Sun Shang Xiang cannot discard equipment cards of her own volition just to activate "Armed Consorts." She must either replace this equipment with another piece of equipment of the same type (weapon, armor, etc.) or this equipment must be the target of another character's Break or Steal. Sun Shang Xiang's powers work well with many characters. She can be very powerful with a good team. 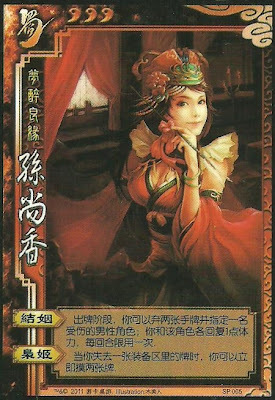 "Armed Consorts" can become a self-perpetuating process if Sun Shang Xiang gets more equipment when she draws cards. Sun Shang Xiang is extremely fragile. Her "Marriage" ability depends on another male character (that is not an enemy that she is unwilling to heal) to be hurt. In addition, this power is extremely expensive, requiring two hand cards. Discarding these two hand cards could leave her open to take more damage outside of her turn. Liu Bei/Guo Jia - These characters can give Sun Shang Xiang equipment cards to activate "Armed Escorts." In addition, these characters can heal each other. During his turn, Liu Bei can give Sun Shang Xiang two cards to recover one unit of health. She can use these cards to activate "Marriage" with him and heal both of them one unit of health. The net effect of this transaction is Liu Bei's health increases by two and Sun Shang Xiang's health increases by one. Sun Shang Xiang can hurt Guo Jia, and he can give her his two drawn cards. She if there are no weapons in these cards, she can simply use them to heal him to make up for the damage that she caused. Fa Zheng/New Fa Zheng - Fa Zheng can give Sun Shang Xiang a heart-suited card via "Dazzle" and remove one of her pieces of equipment, activating "Armed Consorts." In addition, he can give other characters heart cards, take their equipment, and give it to her. During Sun Shang Xiang's turn, she can heal Fa Zheng one unit of health and she draws one card due to "Grudge," lessening the net cost of "Marriage." New Fa Zheng's "Dazzle" can be used in a similar way, but New Fa Zheng can always activate this power on Sun Shang Xiang so long as he has a drawing phase. New Fa Zheng can take two pieces of equipment, activating "Armed Consorts" twice, then allowing her to draw an additional card. At the end of New Fa Zheng's drawing phase, Sun Shang Xiang will have drawn 7 (!) cards (two directly from the deck via "Dazzle," four from the two pieces of equipment removed via "Armed Consorts," and the last card via "Grudge."). Gan Ning - Gan Ning can use any black card to Break Sun Shang Xiang's equipment and activate "Armed Escorts." Sun Jian - Sun Jian's "Brave Spirit" allows Sun Shang Xiang to draw and discard cards. She can choose to discard equipment cards to draw even more cards. Wu Gou Tai - Wu Gou Tai can have Sun Shang Xiang switch her equipment with another character via "Exposure." Sun Shang Xiang draws two cards for each piece of equipment moved via "Armed Consorts." Chen Gong/Zhang Zhao & Zhang Hong/Zhang He - These characters have abilities that allow Sun Xiang Shang to more easily acquire equipment cards. King Despite her fragile nature, Sun Shand Xiang can be a good king. However, her power relies on her luck to draw equipment cards. If she has good (male) loyalists, she can stay alive for a long time. Sun Shang Xiang can be a good loyalist. Most king picks are male, so her "Marriage" can allow her to heal the king during each of her turns. 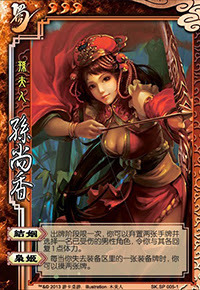 Rebel Sun Shang Xiang's "Armed Escorts" is a powerful ability that can allow her to draw many cards to combat the ruler. Spy Sun Shang Xiang can be a good spy, but she must be careful to keep a low profile. Sun Shang Xiang is one of the best team characters in the game because there are many other characters that can help her with her abilities. However, as stated earlier, she is very fragile. Opponents will be motivated to kill her quickly because they know that she can become powerful in time and she is one of the easier characters to kill because she has no defensive abilities and her healing ability is incredibly expensive.